From Pent-Up Aching Rivers by Walt Whitman, speaks of a different kind of “river” – that of a person’s human desires, which ebb and flow like a tidal river. Poetry is one of the most difficult forms of literature to explain in a research paper. If you are assigned a research paper on Walt Whitman's poems, including "From Pent-up Aching Rivers", our literary experts will custom write you an explication of the poem. Answer the question - Is the poem about love or sexuality? Though a river also is part of the title, From Pent-Up Aching Rivers by Walt Whitman, speaks of a different kind of “river” – that of a person’s human desires, which ebb and flow like a tidal river. It is the cry of a lonely man seeking love, a person who is lonely and who longs for the “perfect body” (line 24) to come to him. This is a soul deeply agitated: “—The furious storm through me careering—I passionately trembling” (l 34), where the poet longs to talk to “the perfect girl who understands me” and to share her body with his (l 45-46). Yet, this does not happen; the poet’s soul is tortured because he is alone. It is only at the end of the poem that we learn Whitman is daydreaming in a restaurant, observing people moving around him. Yet, the one he has dreamed about does not appear: “From plenty of persons near, and yet the right person not near” (l 48). Who is this “right person” of whom Whitman speaks? I interpret this climactic part of the poem to be not the girl of his dreams, but rather the perfection he seeks in his own soul. This is because Whitman’s last two lines (62-63) call upon the divine act to celebrate, while his “stalwart loins” long not for sexual fulfillment (though that is certainly a possible interpretation), but rather the human desire to reach out and touch God and goodness. This is an enigmatic poem that can be read from several perspectives. Here, the soul becomes “The female form approaching” (l 26) which the poet longs to embrace, for “I love you—O you entirely possess me” (l 31). In the end, the poet appears to have satisfied his quest for divine love, for he appears happy and ready to celebrate. Walt Whitman and Homosexuality - Walt Whitman and Homosexuality research papers explore homosexual themes in Whitman's poetry. Song of Myself - Song of Myself by Walt Whitman research papers explicate his poetry. 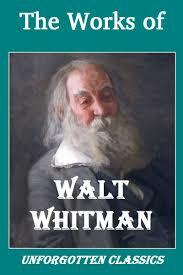 We can help you understand Song of Myself by Whitman. Leaves of Grass - Leaves of Grass Research Papers examine Walt Whitman's famous poem and can be custom written to your exact specifications. Out of the Cradle Endlessly Rocking - Out of the Cradle Endlessly Rocking research papers on Walt Whitman poetry. I Sing the Body Electric - I Sing the Body Electric Research Papers on the Walt Whitman poem from Leaves of Grass. Crossing Brooklyn Ferry - In his poem, Crossing Brooklyn Ferry, Walt Whitman gives the reader his observations of nature and of the human experience, using a simple ferryboat crossing. Public Response to Leaves of Grass - Published in 1855, Walt Whitman's book Leaves of Grass generated words of caution even from those who supported Whitman's brave new stance. Paper Masters writes custom research papers on From Pent-Up Aching Rivers and examine his poem about love and desire.